So there were a couple of all-nighters down in Tampa last month, but there was one night that was just one adventure after another. Basically, I had to run a friend out to the airport at 4 in the morning, but then on the way back from the airport, I must have stopped by every 24-hour-place along the way home. I mean, back to the resort. 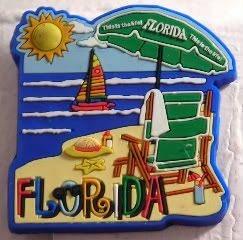 I picked up this magnet at like 5 in the morning at a CVS on Tampa Road, I think. Really, who hangs out at a CVS at 5 in the morning? There were a least a half dozen running around. The cashier asked me if the Championship was hiring. And yes, because I'd forgotten to take off my all-access pass from the day before. Heh. But that's nothing compared to the fun people at the Walmart (no, not the groceries-only Walmart - which I didn't even know existed!). Seriously, 24-hour-Walmarts. Interesting place to be at 6 in the morning. And boy howdy, are the employees friendly! Actually, if one had one's druthers - I think 6am might actually be the best time to shop at Walmarts. Heh. Oh, yeah. This is the life, indeed.